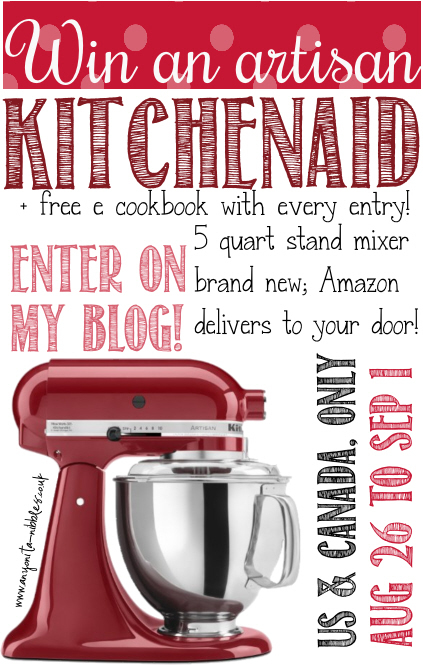 Enter to win a Kitchen Aid Mixer plus you get a cool freebie! I am so excited today to have this awesome giveaway for one of you to win a Kitchen Aid Mixer! I LOVE my Kitchen Aid Mixer more than anything in my kitchen and use it all the time! We also have a FREE e-book with recipes that use a Kitchen Aid Mixer! It includes my absolute favorite recipe which I am actually making today! Giveaway runs from August 26, 2014 to September 1, 2014.